Bob Walshon got "stoned." And he hopes experts can identify the rock he says fell from the heavens and struck his shoulder. "I came for the fishing," quipped the 51-year-old Jupiter health care consultant Monday, recalling why he had moved to the area. "I thought I'd be getting hit by a bunch of dolphin." But Walshon's neighbor, Mike Pollutro, is so certain the rock is a meteorite that he's e-mailed specialists to confirm it. "I've looked at thousands and thousands, and I've never seen one that comes close to what Bob has," said Pollutro, a World Airways pilot and meteorite collector. The rock socked Walshon six years ago as he was checking out weeds in front of his home in Holly Cove subdivision, in north Jupiter. He spun around and yelled, "Who did that?" Walshon recalled. But no one was there. The green and gold flecked charcoal-colored stone was too hot to handle, he said. So he let it cool, then stored it in a drawer. Meteorites are fragments of planetary bodies that travel 4.5 billion years before colliding with Earth, according to David A. Kring, associate professor of Cosmochemistry and Planetary Geology in the University of Arizona's Lunar and Planetary Laboratory. They come from asteroids, though some are confirmed to have lunar origins. Researchers suspect others might be from Mars, Kring writes. People worldwide each year find what they believe to be meteorites, according to Kring. The spacey stones are comprised of different minerals, and Walshon's local find made a metal detector twitter.Pollutro, meanwhile, "beamed the story to a bunch of people" and is hoping researchers can help determine the rock's origins. Area residents bring about one each year to the West Palm Beach-based South Florida Science Museum for testing, spokeswoman Elizabeth Dashiell said. "I'm sure (some meteorites in this area) have been confirmed," Dashiell said. "But I personally have no experience." Meteorites typically are named based on the latitude-longitude locations where they're found, Pollutro said. So that no one assumes Walshon's local discovery rained from the planet of the same name, Pollutro pointedly refers to it as the "Jupiter, Fla." meteorite. 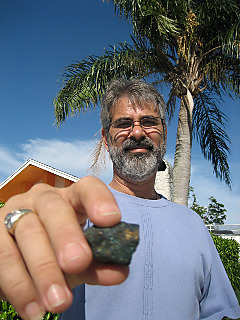 Bob Walshon holds what he says is a meteorite. He and neighbor Mike Pollutro say they can't refer to it as the "Jupiter Meteorite," because people might think it hailed from the planet of the same name. The research is about to get under way to prove it came from the sky, Pollutro said. • Despite myths, meteorites do not glow and are generally no more radioactive than pea rock or coral. • Meteorites are either stony and slightly heavier than typical rocks of the same size, or they are metallic and much heavier. • Those that are metallic ring like a bell when struck with a metallic object. • Recently-fallen meteorites feature glassy, smooth coatings. • Those that are older and weathered appear blanketed in dark brown. • Most, but not all, are magnetic. 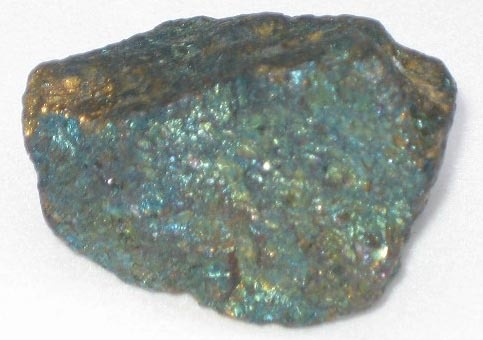 After learning that his 'meteorite' is more than likely terrestrial Peacock Copper Ore, Bob writes, "Thanks for your information. Now I need to find the cruel person that must of threw this object at me and hid."